Fig. 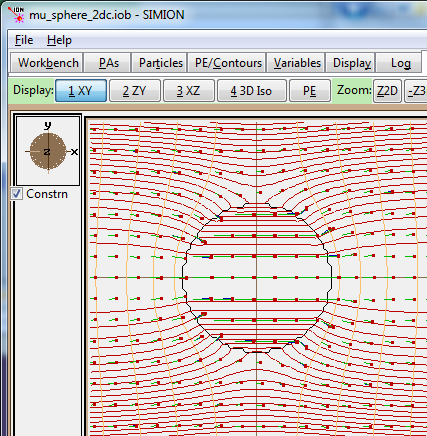 56 One of the SIMION Example: magnetic_potential examples that run under Early Access Mode and utilizes permeable materials: permeable sphere inside magnetic field. The figure shows magnetic equipotential contour lines (orange) and magnetic field vectors (green) in the viscinity of the permeable sphere. SIMION Refine has new support for solving magnetic scalar potential in the presence of permeable materials. This will be officially supported in SIMION 8.2 (see SIMION® Roadmap (8.2 and Beyond)) but this particular feature is largely implemented now and available for beta testing via Early Access Mode. Previous versions of SIMION always assumed magnetic poles had infinite permeability (e.g. 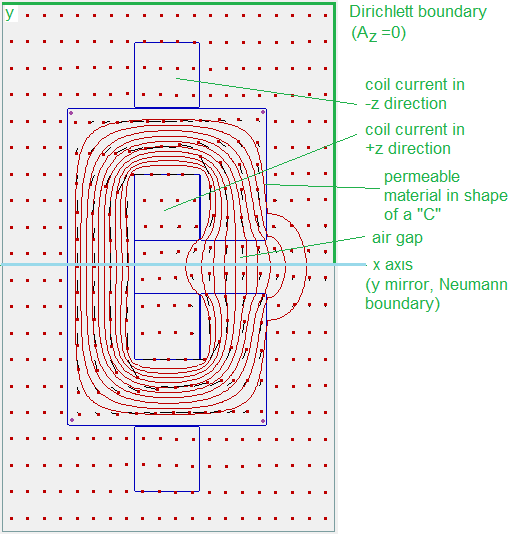 flux perpendicular to pole surfaces and magnetic scalar potential having equipotential lines along surfaces). Permeable materials can be accounted for by first defining a magnetic PA in the same manner as done since SIMION 7.0. This magnetic PA defines the boundary conditions for magnetic scalar potential, and it’s the PA in which magnetic scalar potential is solved in (via Refine). You will also need to define an additional PA which will represent the relative permeability throughout space. This permeability PA is consulted when refining the magnetic PA. The entire process is quite similar to handling dielectrics in the case of electric fields, so it’s recommended to familiarize yourself with that. However, also see Magnetic Potential for important details specific to magnetic field theory. Many examples of permeability are included in SIMION Example: magnetic_potential (included in the 8.1.1.0-TEST installer and runnable under Early Access Mode). Fig. 57 One of the SIMION Example: magnetic_potential examples that run under Early Access Mode and utilizes permeable materials. This is a “C” magnet consisting of coils of current around a permeable material, which creates a magnetic circuit (electromagnet). The magnetic field also passes across an air gap (center), where fields fringe. Shown is the XY planar cross section of the C magnet, modeled in 2D planar symmetry. Field lines (along constant Az) are in red, and field vectors are also shown.